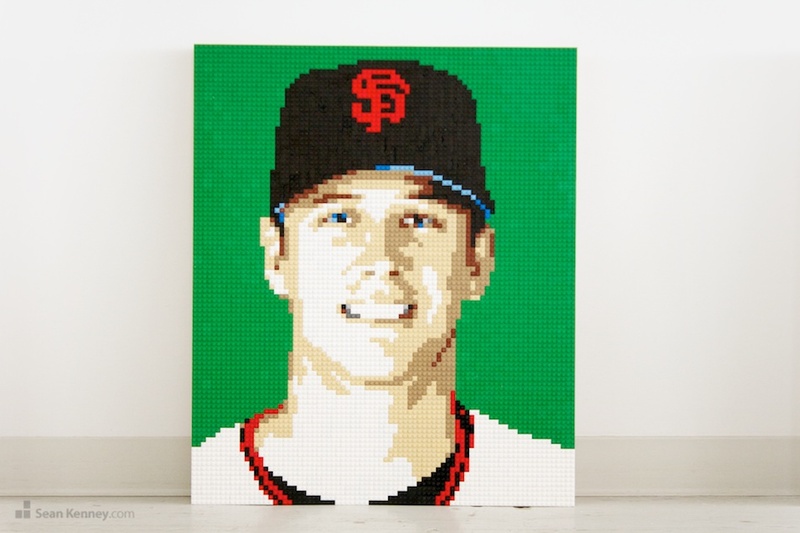 This portrait of San Francisco Giants baseball player Buster Posey measures 25" x 30" and is built with over 5,000 LEGO pieces. It's part of my touring exhibit, Big Leagues Little Bricks, celebrating the beauty and lore of baseball as a part of Americana. The show is on display at the Louisville Slugger Museum now through September 2013. The portrait is on display together with portraits of Derek Jeter (New York Yankees) and Joey Votto (Cincinnati Reds). The three portraits were designed as a "matched set" that together combine the bold colors of red, green, blue, and yellow with the subjects' faces. As always, my portraits are hand-drawn (not computer-generated).